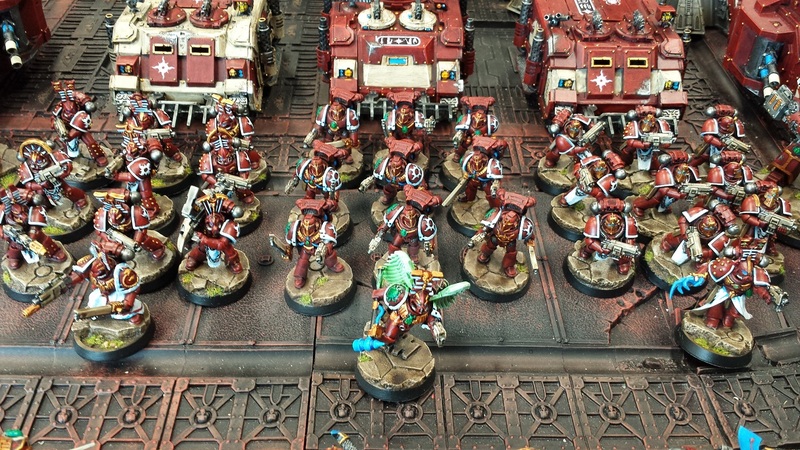 A bittersweet time has arrived, and the most recent version of the Thousand Sons are going up on the auction block. That means it's time for a set of send-off pictures, and I so liked how the shot of the Imperial Fists turned out at the local GW shop, I took the Sons down for a photo shoot! 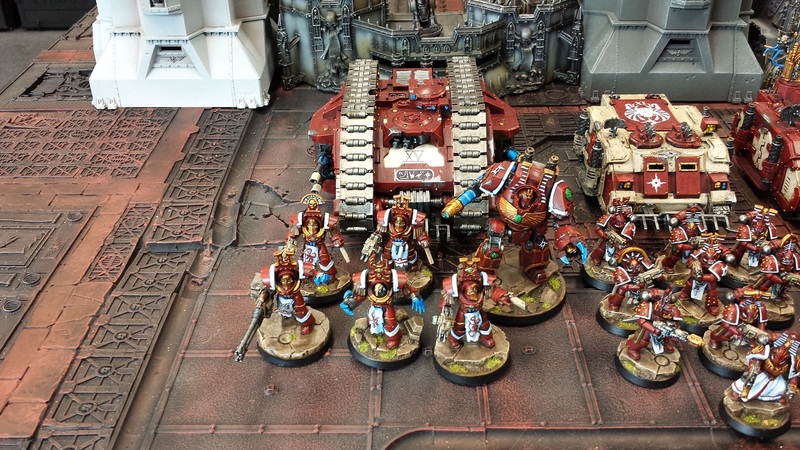 I will say that these have been my favorite incarnation of the Thousand Sons of the three I've done, definitely felt they were a nice cohesive force and the mix of bits and kits gelled nicely. 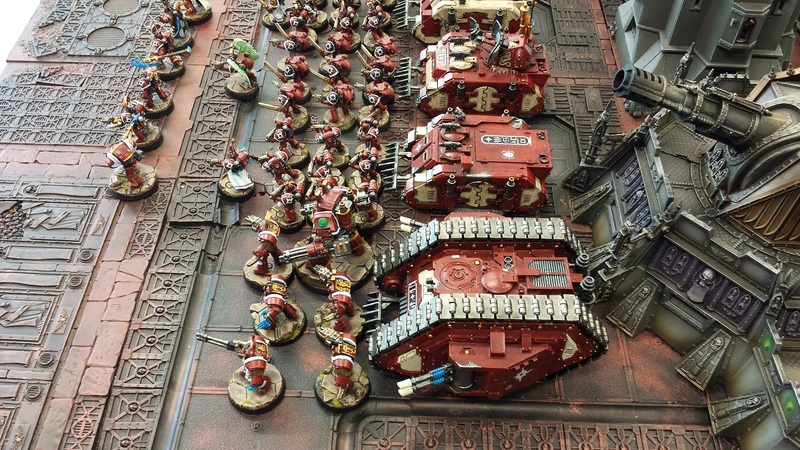 Weighing in at about 3000 points (depending on which characters and wargear are chosen, it was designed as a "Pride of the Legion" force, so the veterans and terminators also counted as Troops choices and they performed well on objective missions (since all of the infantry were scoring). Fun mix of characters, with several sorcerers, and several champions and praetors in various marks of armour. Quite liked bastardizing a couple Deathwatch models for parts too, the Blood Ravens librarian was rather cheeky! 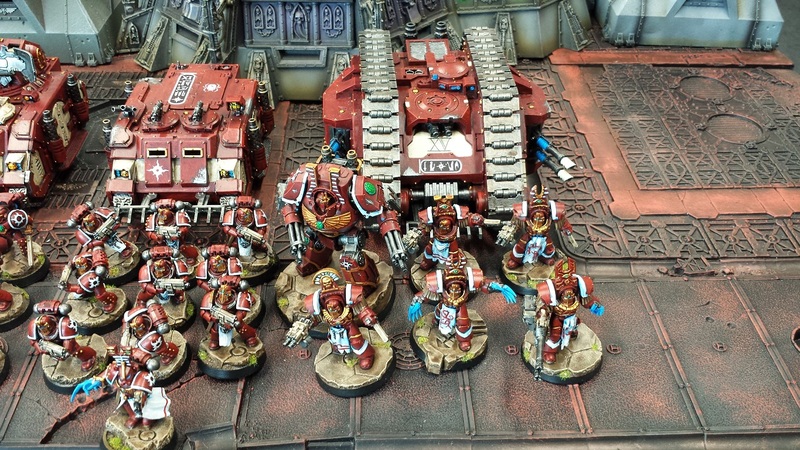 The Terminators were a mix of Wargame Exclusive kits and the plastic Cataphractii, and bear a striking resemblance to the upcoming 'real' FW variants. Will likely do another set of this style of kitbash for the upcoming version of the force, as I have a mess of bits left over to do so! 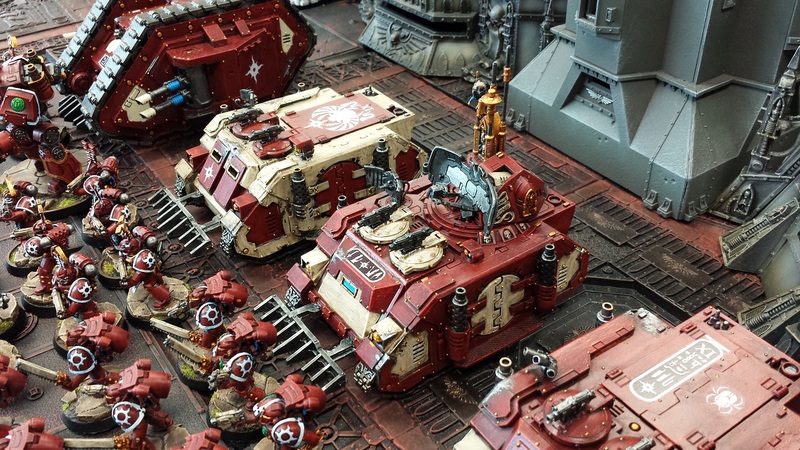 The Contemptors are the one part of the army that I'm already feeling a twinge of sellers remorse over, so there will definitely be a couple more in the new force too, and I especially am looking forward to the new Osiron variant! The veteran squad always performed admirably, and as already shown I'm doing a pair of vets in the new version, though I am switching up to dual meltas as the missile launcher never quite performed well on the tabletop for me. 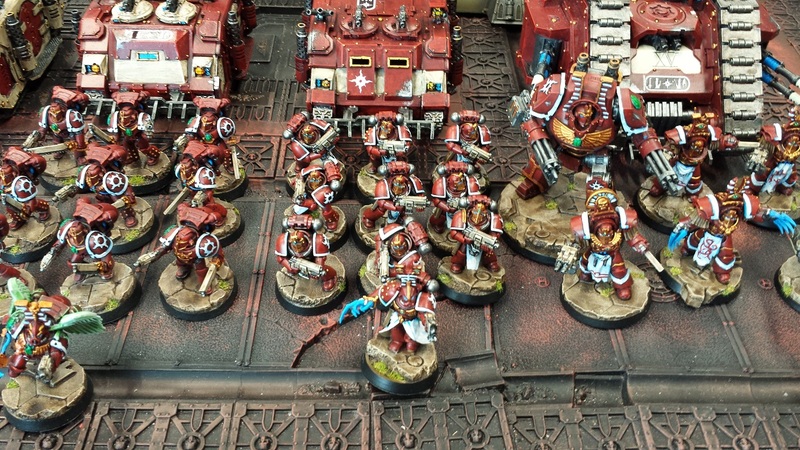 The lone 10-man tac squad ended up being a bit of a gap-filler in this force, next time around Sergeant Hesyre is getting the full 20 brothers and be upgrading from a Rhino to a Storm Eagle as well! The other bit of incipient sellers remorse is the Damocles command Rhino, really enjoyed how the kitbash worked and will likely beg one of my UK buddies to pick up another set of the command tanks from WHW at some point. All in all a very pleasurable project to work on, and I'm all the more excited to get stuck in on the new version using all the awesome new bits and kits that have come out in recent months, not to mention all the cool new stuff previewed at the recent Heresy Weekender! 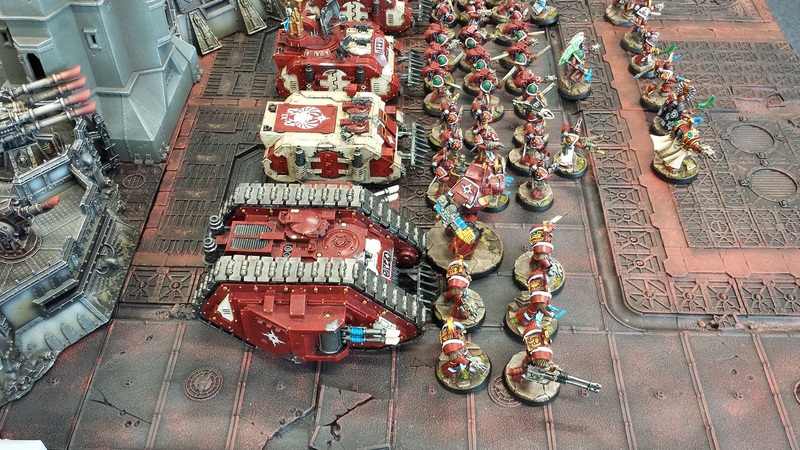 At the moment the army is up on eBay, and includes Battlefoam trays for the lot (and at the buy it now price I'm including the PackAIR they fit into as well). Unfortunately due to the way shipping and whatnot works these days I'm only currently selling the army on there to stateside buyers. It would likely cost $250 or more to ship overseas which is a shame - it didn't used to be so extortionate. That said, if you are interested and you're overseas drop me an email and we can discuss the options. Mordian, beautiful. Shame to see it go, but soon to be replaced by equally awesome models and I bet an expanded force, perhaps 6000pts ;). Hope they go to a good home. If you still need one Command Rhino by May, I'll be up WHW then. Hopefully someone nearer can pop in sooner for you. Someone it about to be a very lucky boy when this drops through the letter box. Feed the beast man, feed the beast!!! Oh if I had the money! I struggle to comprehend letting go of such a beautiful army, you are a machine! Such an awesome army Joel. Thanks as always for sharing your build ups! I look forward to your next endeavor! They look very good all lined up though, bravo. As ever I am sure the closest of doom shall supply some good pieces to replace them. @Siph_Horridus: Thanks man! I am quite enjoying the new build for the army so far with all the new bits and kits that have come out from both GW and FW. I may take you up on the WHW offer, I really appreciate it! @30k plus 40k: Cheers man! It may not sell as an army, it's a big ask to have someone drop a full lump sum for everything at once. We'll see how it goes, they might get chunked up into units and sold off piecemeal if there's no bites. After all, it's easier to get 10 people to spend $100 than it is to get 1 person to spend $1000! @John Stiening: Thanks man! I will say I suffer from occasional seller's remorse, but any funds from miniature sales just get plowed back into the hobby and keeps me from spending as much of my acutal hard-earned cash so it takes some of the sting out of it! @Greg Hess: Thanks bud - More Scions of Magnus to come over the next few months culminating in NOVA in September. Hope you might be able to join some Heresy events in D.C. later in the year! @Rory Priest: Haha! 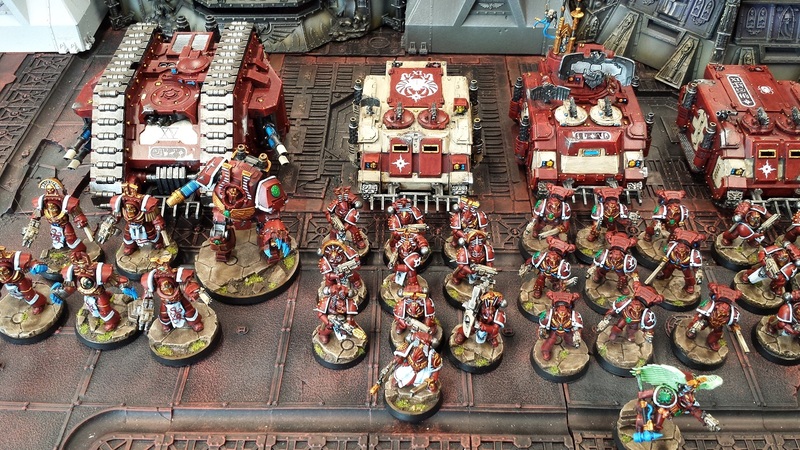 It's more crimson and bone for me, though I am going to be working more of the blue into the mix on the upcoming army as they begin their descent into corruption! Gotta love a self sustaining hobby! Lovely looking army, I hope it finds a good home soon! Here looking to TS version next! Sorry to see this beauty go, but already you have a new version that will be cool once done. Good luck on the sale my friend. @Greg Hess: Awesome! Hopefully we'll be able to face off in a game! @Col. Hertford: Thanks very much! Should have some test models to show fairly soon! @Dai: Thanks, man! There's a few twinges of pre-sale remorse but when it's gotta go, it's gotta go! 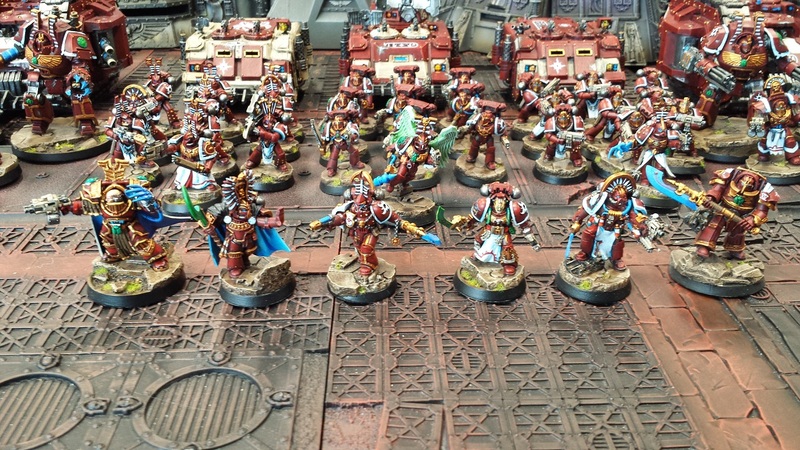 Such a nice army, it must be heartbreaking to put them up for sale. My God, how many has it been now? Each one as great as the last. @#2501: Thanks man! I do always feel a little twinge of remorse when putting a project up for auction, but as it's the main way I fund the next projects the excitement of being able to buy a new raft of minis overcomes the twinge. :) Here's a link to my gallery where I have all the projects I've worked on for the last eight-ten years or so, it's sometimes fun to go back through the archives and see how things have progressed! 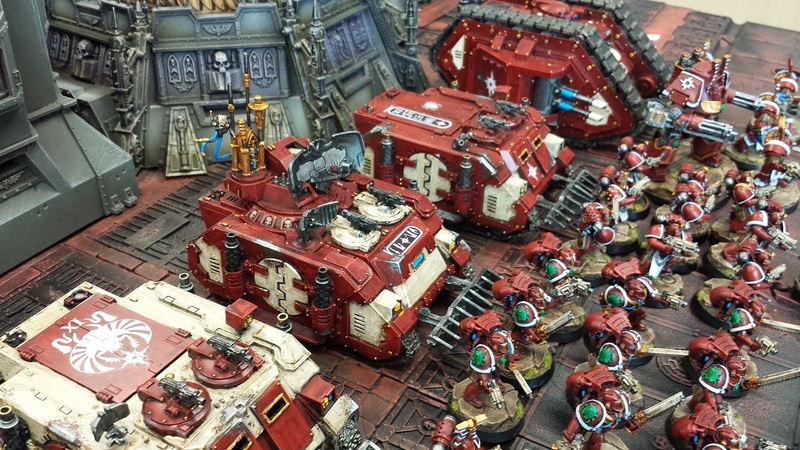 YOu may have said it before, but why paint them up and sell them only to make another iteration? @John Brand: Hah! Partially because I'm planning a different style of force this iteration (late heresy/more chaos-y), and partially because I'm a little unhinged. To be honest I find the building and the painting far more fun than the 'having a finished army' so I generally sell them off to help fund the next project. I totally get the paint/model enjoyment, but usually I use that opportunity to start a new army not redo one (or at least paint the marines a different colour haha).